Quick! Say that five times fast! Unlike today’s title, today’s blog post is going to be short and sweet, and aims mostly to point you toward the most insightful, relatable essay about running I’ve read in quite a while. 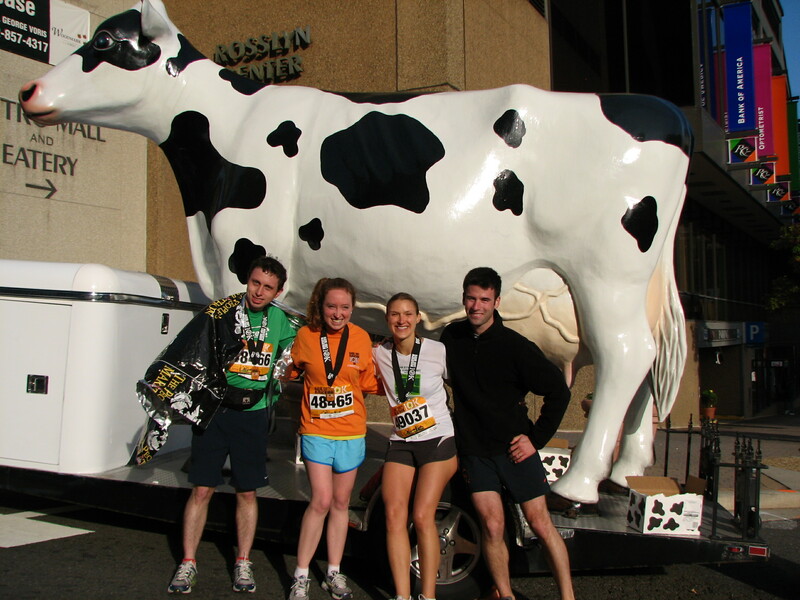 What a Cow Taught Me About Running tells a simple story: Girl discovers running. Girl gets faster at running. Girl gets injured. But this story has a twist: After girl gets injured, girl returns to running with a new, healthier sense of perspective, having pushed past the “perfection block” by running races that were out of her comfort zone, or just for fun, or just for the experience. I came to that realization on my own about a year ago, when I showed up for the starting line of the Rock ‘n’ Roll Virginia Beach Half-Marathon on Sept. 5, 2010, prepared to cover the distance—and that’s about all. It was a stark contrast to my most recent half-marathon attempt, the National Half Marathon in March 2009, when I trained hard and PR’ed. I trained so hard, in fact, I skipped a lot of fun stuff beforehand—a wine tasting with friends (drinks the night before a long run the next morning? No way! ), a ski trip to Tahoe (if my muscles had any juice left in them, I needed that for training). It’s not that anything was wrong with the second method, or that training to run a race quickly wasn’t extremely rewarding in its own way. It’s just that I’m at a different, calmer place with my running now—and for the time being, I really like that place. I’m currently viewing my pace stats the way I view my weight on a scale—arbitrary, and having nothing to do with what’s really important. I’ve been running for the fun, peace and natural beauty of it (hello, Rock Creek Park! ), and racing for the fun and social interaction of it. The next race on my calendar is the Marine Corps 10K in October. Last year, I jogged it, thanks to a possibly-broken toe, and enjoyed every step of it. This year, I think my main goal is to have even more fun, no matter what my time is. Have you followed a similar path with your own running? If so, tell me about it below! Love this post, Amy. Great insight and wisdom, and acceptance in there. I’m training hard for a marathon (it has been many years since my last road mary) and enjoying some familiar elements – geeking out over the numbers, long run Sundays, running a steady pace for more than a few minutes – but I’m also very aware of the sacrifices I’m having to make. I miss all the spontaneous bike rides, It’s worth it, but I’ll be glad to go back to trails and leave the strenuous, scheduled running behind. Last year, in the midst of my injury, I was signed up for the Army 10 Miler & decided I’d just jog/walk a few miles of it. I ended up doing the whole 10 miles, feeling good, going slow and easy, smiling, enjoying lollygagging and people watching instead of the usual lung-searing, leg-burning race experience. And it was just what my spirit needed. Now that I’m healed, I truly appreciate every run.